Mali (French: République du Mali) is a landlocked country in West Africa. Mali is bordered by Algeria to the north, Niger to the east, Burkina Faso and Côte d'Ivoire to the south, Guinea to the south-west, and Senegal and Mauritania to the west. Its size is just over 1,240,000 square kilometres (480,000 sq mi) with a population of 14.5 million. 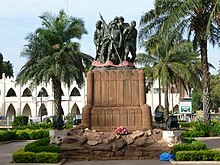 Mali's capital is Bamako. Spokesperson of the Ministry of Foreign Affairs Abdelaziz Benali Cherif stressed in a communiqué on the terrorist attacks in Kidal, Timbuktu, quoted on AllAfrica (February 13, 2016), "Mali - Algeria 'Vigorously' Condemns Terrorist Attacks in Kidal, Timbuktu"
It is the case of Mali whose very existence was threatened seven months ago by the barbarism of terrorism and which managed to find the strength to elect its new president. French Foreign Minister, Laurent Fabius on Mali's peaceful voting, quoted on BBC News, "Rebirth of the rule of law in Mali? ", August 16, 2013. Mali is on the road to recovery. It is recovering its territorial integrity, is actively preparing for the presidential elections in July and, with the international donor conference in Brussels, is making progress in its development. French President, Francois Hollande, on Mali's recovery, quoted on BBC News, "Donors pledge $4bn for Mali's reconstruction", May 15, 2013. Fr. Dembele, quoted on ZENIT, "Although improving, crisis in Mali is far from over", February 4, 2013. They took Diabaly after fierce fighting and resistance from the Malian army that was not able to hold them off at that moment. About five [rebel] vehicles entered the town. Now they're stationed about 200m (650ft) from the military camp but they haven't taken the camp. They've killed a few soldiers. French Defence Minister, Jean-Yves Le Drian on Mali Islamists capturing cities, quoted on BBC News, "Mali Islamists seize town amid French intervention", January 14, 2013. This page was last edited on 10 March 2016, at 13:39.